It is an irony ~ CSK won the IPL with a team of oldies, which at the start seemed that most of them may not be fit enough for longer versions of the game – yet they excelled !! A yo-yo is a toy consisting of an axle connected to two disks, and a string looped around the axle. It has some similarities to a slender spool ~ but that name is dreaded, at least by some Indian cricketers. 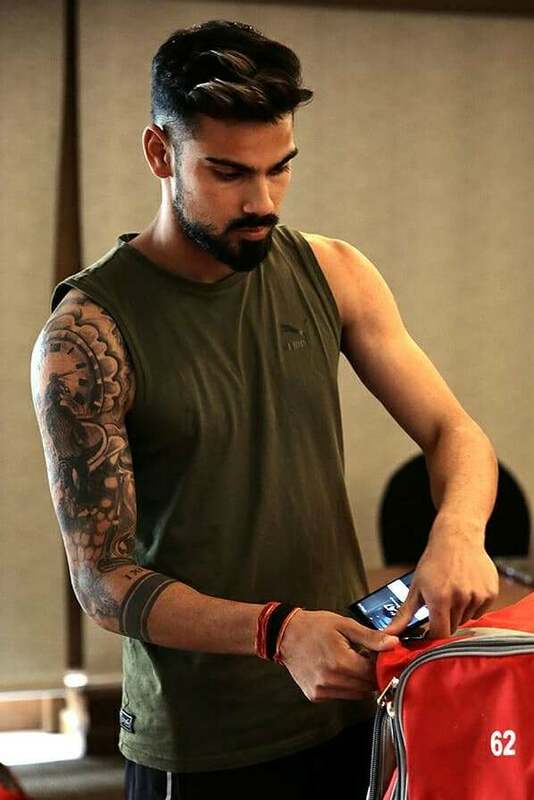 Can you identify this tattooed Indian cricketer ?? In sports parlance, Yo-Yo is a variation of the Beep test, a running aerobic fitness routine that Indian cricketers had to undergo in the past. But passing Beep was not mandatory for selection as is the case with Yo-Yo. Ambati Rayudu was left out of the one-day squad for the England tour in July after failing the test. Yo-Yo probes a sportsperson’s endurance and ability to pace himself; towards the end of the maximal running aerobic fit. The dreaded ‘Yo-Yo’ tests the players capabilities and not their talents – the test requires players to pace themselves methodically — starting with a modest jog to the eventual gut-busting sprint — as they shuttle back and forth between two rows of cones kept 20 metres apart. Each run needs to be timed with the three beeps that are played in the background. These are the signals for start, turn and finish. With the timing between the beeps constantly decreasing, each subsequent 40m circuit requires more speed. Getting beaten twice by the beep means the end of the test. The final score is determined by the laps completed and the speed gathered. It is stated that for starters, the Indian cricketers have been asked to achieve a basic score, but gradually the fitness bar will be raised. “On the yo-yo scale, the grade needed to be achieved is 16.1, which is the minimum standard set for an elite international sportsman. The players have been informed of such parameters and most current players have already achieved this standard. In case of any exceptions, we’ve given them sufficient time to raise their fitness levels.” A former member of the Indian coaching staff said the team management should keep in mind that aerobic endurance can’t be the only criterion for selection. “The yo-yo test can’t be the only criterion to test a cricketer’s fitness. It’s a skill-based sport. There’s so much mental stamina that’s required too,” he said, adding that many of the past legends would have failed the test. True can one imagine putting the likes of Erapalli Prasanna, Bishan Bedi, Gundappa Viswanath, Vengsarkar, Ashok Malhotra and more going through this – is it not the talent that is material ? – Kapil Dev could be a stand out by any testing parameter ! After that mind-wracking loss at Edgbaston, the scene now shifts to Lord’s the most famous Cricket ground which many not be drier. Ben Stokes, who changed the fortunes in the last innings would miss having somehow messed up in swing-friendly conditions despite the availability of their best bowling resources. The conditions are expected to favour India more at Lord's, where the pitch wore a green look two days out but is expected to be drier. India have more spin options, and their best new-ball bowler is injured. Despite the failure to win the first Test, India have positives to look at. India's bowling, while still not consistently of the match-winning variety in these conditions, looks better and deeper than it often does. If it doesn't fall apart, it will keep them more competitive than if only their batting was working. England made one change the day after the Test, partly to deny R Ashwin so many left-hand batsmen to feast on, partly as a response to Dawid Malan's form with the bat and in the slips. The 20-year-old promising right-hand batsman Ollie Pope has been confirmed to make his debut. Stokes would miss for different reason ! - Ben Stokes has been described as "the main aggressor" in an incident that left a man with a fractured eye socket on the third day of his trial at Bristol Crown Court. Stokes, who is standing trial for affray alongside Ryan Ali and Ryan Hale, was described as "trying to get at another individual" by Mark Spure, an off-duty member of the police force, who witnessed part of the incident. Spure, who works for Avon and Somerset constabulary as a PCSO (police and community support officer), told the court he "saw a group of people fighting" as he made his way home at the end of a night out. He said he attempted to get between Stokes and Ryan Ali as Stokes appeared to be "the main aggressor" but, as he did so, Stokes punched Ali "with a clenched fist." Ali, Spure said, was "trying to back away or move away from the situation" before the punch was thrown. In U19 WC in Bangladesh, Gideron Pope was one of the most talked-about players due to his big-hitting in the first ten overs. Mayank Dagar, too made fine impression with 11 wickets at 9.36. He came into the XI only after India's first two matches. From there he was India's only specialist spinner till the final and he picked at least two wickets in each of his four matches. The left-arm spinner used flight and dip often to beat the batsmen and played a major role in stifling oppositions by finishing with an economy rate of 2.88. This year, Dagar was picked up by the Kings XI Punjab in the auction for his base price (20 lakhs). A classical left-arm offspinner who plies his trade for Himachal Pradesh, Dagar has been brought up under the tutelage of his uncle Virender Sehwag. Just as Indian team were announced for England/ Ireland tour, Ambati Rayudu, Sanju Samson had to be dropped for not clearing YoYo test. 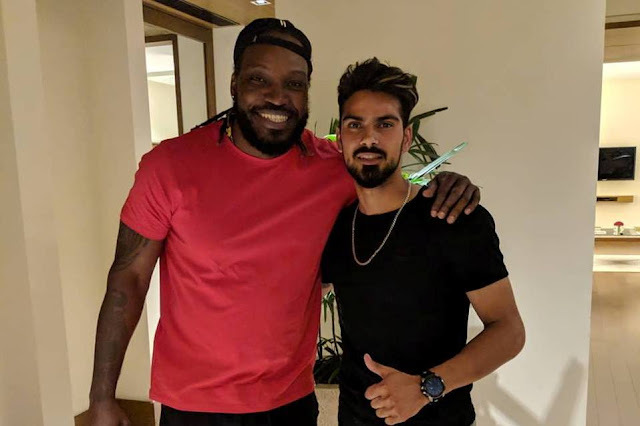 Himachal Pradesh and Kings XI Punjab player Mayank Dagar recently cleared the Yo-Yo fitness test with reportedly one of the best scores by any Indian player. It is mandatory to score 16.1 in the test to clear the test. Last year Virat Kohli and Manish Pandey were the top scorers in test. While the Indian captain managed to score 19, Pandey trumped him with 19.2. It seems Dagar reportedly had surpassed them with yo-yo test score of 19.3. The 21 year old very good looking spinner Mayank Dagar is a fitness-freak and could make a big impact in the years to come.